The 9 tracks on this CD by THE SILVERTONE PROPHECY BAND exemplify Gary Shane’s intense soulfulness and passion with exquisite lyric content and melody. MASSACHUSETTS, February 26, 2001: THE SILVERTONE PROPHECY BAND will be performing, in October 2001, at the Half Note Club in addition to other venues in Athens, Greece. GARY SHANE, a Boston native on his third trip to Athens, the city he loves and that loves him, shares the stage and his mesmerizing talent with COLLIN TILTON on tenor sax and flute. 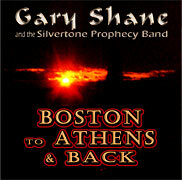 THE SILVERTONE PROPHECY BAND, features Shane providing his familiar, passionate vocals, acoustic guitar and harmonica. Tilton brings his texture and uniqueness to the ensemble, helping to create for Silvertone the rhythm, blues and jazz influence that Tilton developed with Van The Man Morrison. Ken Clark (Hammond B3 organ), Costas (guitar), Stalios (bass) and George Dragotta (drums) round out the sweet, evocative and energizing folk/rock n blues sound Shane is noted for. On their return to Boston, the Silvertones will be performing at the Lizard Lounge in Cambridge, the Firehouse Theatre and the Grog in Newburyport, Massachusetts. After leaving the Boston club circuit six years ago, Shane waxed introspective, writing such hits as Destiny, a true American classic, and Johnnys Coaltrain, a tribute to John Coltrane whose intimate and dynamic jazz changed the shape of American music for all time. Soon to be released, in collaboration with Tilton, THE SILVERTONE PROPHECY BANDs new CD melds the true cream of the great singers/songwriters of modern music with some of the classic albums, celebrating the foundation of American musical greats.